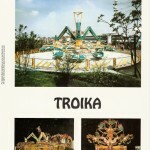 The Troika* was the first ride of its kind, manufactured by HUSS in the early 1980s, described as “an ideal family ride … with high capacity and harmoniously balanced ride patterns.” Due to its large size however, it is more suited to amusement parks than as a fairground attraction. The ride consists of 3 arms, each bearing 7 gondolas – seating 2 people. The three arms turn one way while the planet wheels turn in the opposite direction. The arms lift upwards with the aid of hydraulic lifting cylinders to an angle around 40° exposing riders to varied G-forces. The movement is very smooth and mild compared to Tivoli’s smaller and faster Scorpion. Nevertheless, it is a great ride enjoyed by people of all ages. The HUSS Troika folds up onto 3 trailers, while the faster Tivolli Scorpion is surprisingly compact, fitting on a single trailer. There is at least 4 park Troika’s in North America, 5 in Europe and 1 in Australia. *The word Troika has 2 known definitions: 1. A traditional Russian dance 2. A local term for the cheapest way to get drunk in Russia – share a bottle of Vodka between 3 people! 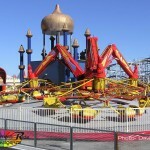 Dear David,I noticed that you do not have the Himalaya (Reverchon,Mack,or Wisdom)rides.You also don’t have Flying Bobs or any other Flying Bobs type rides.You do need to add those in your website..I do recommend for you to check out Tyrone Mays site which is based on the Reverchon Himalaya rides..
hi Tom, the Himalaya / Flying Bobs / Matterhorn is on my ‘upcoming’ list and will hopefully be on the site by Xmas 09. Regards, David. I’ve only ridden one Troika before and to be totally honest, I was quite disappointed with it. I liked the movement but I found myself wanting something a little more, perhaps a bit faster or another little twist; I’m not too sure. I much prefer the faster Scorpion despite it making me feel very dizzy at the beginning and end of the ride cycle. I was more a fan of the Octopus/Spider rides but these are nice, it’s a breezy ride and people who don’t like fast or spinny ones tend to like this one. Guys, what are you talking about?? Troika just means “three of something”. I’m actually Russian and I’ve never heard about dance called “Troika” and I absolutely have never heard about the word is used for term,which means the cheapest way to get drunk. i rode a ride just like this! There is a Russian Troika Dance, where a man dances with two women. Rode Troika at Adventureland Long Island in the Early 80’s. Only one that could compare to it was the Schwartzkopf Monster at Great Adventure. Troika is also a hitch of three horses side by side. There was a Troika traveling the states back in the early eighties. I think it was owned by Strates Shows or Deggeller Attractions. To my knowledge no carnival has toured with a Troika. Strates Shows did have a TriStar, which was more or less a scrambler that raised up at an angle about 70 feet in the air. It was a great ride, but Mr. Strates told me he sold it because the Enterprise beat it every spot. It took 3 trailers to move so guess he couldn’t make money on it. Always loved this ride. It did not come out in the early ’80s, though. It was introduced in the US in as early as 1974. It was at our local amusement pier in Seaside Heights, NJ in the summer of 1975 along with the debut of HUSS’s Enterprise. 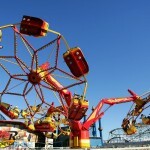 Both rides ushered in a whole new era of rides making the Spiders, Scramblers, & Roll-O-Planes look like antiques.